I really can't have tea with my mother. 32 years since she passed away. Very young and very suddenly. Not a day goes by that I don't think of her. She had such a great sense of humor! to our house because she made them laugh. Mom was a traditional mom. She never worked outside the home. And she never learned to drive. She was tiny, 4 foot 11 and a half. She always stressed the half LOL. To her, the actors were her friends. She'd refer to them by their first name. she had a wedding to go to LOL! 32 years have passed and I can still taste it. shuffle dance to "Tea For Two". Denver to her birthplace, Iowa, for her birthday. well rest, along the way. a birthday tea party together. and then layered on a scarf from my thrift shopping. The tea cups and saucers are from Ross. filled with flowers, from Mr. B. The pink roses are from Michael's. friends that she was unavailable. She had a tea party at her daughter's to attend. A beautiful tribute to a wonderful mom. What a terrible blow to your family. That was beautiful! Thank you for sharing! I'm your latest follower! Mom would be proud of you, a beautiful table and a beautiful tribute! Kathe I have tears in my eyes. What a sweet moment to share with all of us. I am so sorry you lost your Mom so young. She sounds like a wonderful woman! I'm sure she is dressed up and 'unavailable' while she has tea with her precious daughter. Kathe, your mom is smiling down today. she is sitting at that table with you..and you both will bust out dancing soon! This was the sweetest post to your loving mother. She did well raising you, you are an unbelievable mom, wife and friend. Please tell your mom I said thank you for doing such a great job, when you sip on tea with her. Love ya mucho sweetpea! Oh, you made me cry! My mom also never learned to drive... your post made me smile and cry. You should post that again on Mother's Day! Thank you for sharing this last week at All my Bloggy Friends - I can't wait to see what you link up at this week's All my Bloggy Friends! We never get over missing out mothers. I am sorry you lost yours so suddenly and so at such a young age. 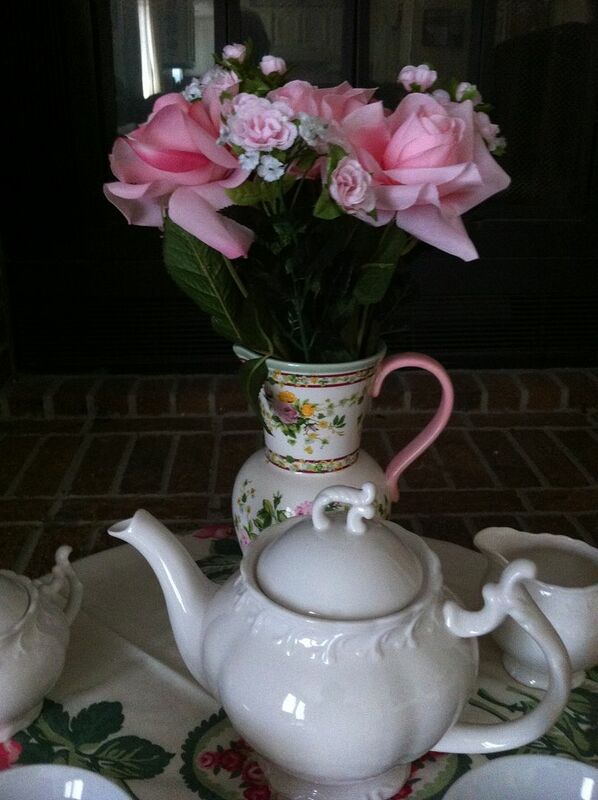 I know that she would love this tea you have made in observance of her birthday. Oh, Kathe.....sweet, dear Kathe. This is just the sweetest thing ever. I love how you just put it all out there. Your Mom is proud as she can be, I'm sure. I love it that she actually dressed up for the soap opera wedding!!! That's my kind of gal!!! You have wonderful memories tucked away which are apparent in the lovely tea setting you created for the two of you, and I am confident that someday you will hit that fried chicken nail on the head. I'll hear you whooping and hollering all the way here in Lee's Summit! :-) You go for it, girl. Happy Birthday to your dearly departed Mom. May she continue to rest in peace. SO sweet Kathe! I am lucky enough to still have my mom and this is a great reminder that I need to make more time for her. Thanks so much for sharing your Mom with us. I wish she was still here too, as my Aunt Sally...She was so accepting of others. What a wonderful tribute to your mother Kathe. My Mom was a tiny woman, too...she liked to say she was almost 5'! What beautiful tribute to your mother. All those priceless memories etched in your heart forever. The older I become, the more I realize how much my mother has done for me and how much I need her. The love is forever unconditional. The tablescape made me feel as if I was watching both of you having tea and sharing "girl talk." I know she is looking down on you and proud of all you have accomplished. Joshua knows a little more about his great-grandma and he has a smile ear to ear. We love you and are so proud of your blog. Thank you for sharing a piece of your mother. It is a great reminder that we only get one mother and we need to treasure that love close to our hearts!! Thank you Lisa, mike and my sweet peanut Joshua :-) Love you all so much! That was such a beautiful post about your mom! I lost my mom 24 years ago and I feel the same way! I loved my mom so much and still miss her to this day. Thank you so much for sharing! I know that she would have enjoyed your tea today. Blessings and Hugs to you tonight! Awwwww, Kathe, what a heartfelt, lovely tribute to your Mom. She sounded like such a fun loving person. I know she was looking down and dressed up for your beautiful tea party with her special daughter. Kathe, this is such a touching post. So sad that you lost your mom at such an early age. I was only 9 months old when my father passed. Too young to know what I missed. Just memories mom would tell me. Happy that you have such fond and humorous memories of your mother. You bet she would be telling everyone she was unavailable. I'm sure she's smiling down on you and that gorgeous table set for tea for two. Thanks for sharing with SYC. What a beautiful elegant table. Your mom would have been proud. That was a sad story Kathe. I am so sorry. She sounded like a beautiful, fun, vibrant woman. Thinking of you my dear friend. I never knew my mom, who died when I was very small. I'm going to do a remebrance x-stitch sampler. I like your teapot. Now you need a tea cozy for it, just like the British! I'm posting for Deva of Fresh Pastry Stand. What a sweet way to remember your mom!! 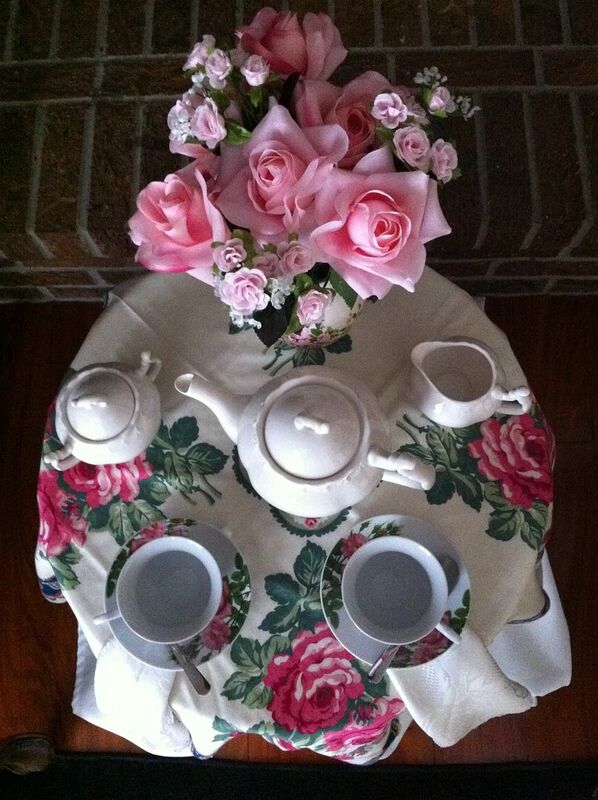 Pretty tea setting! 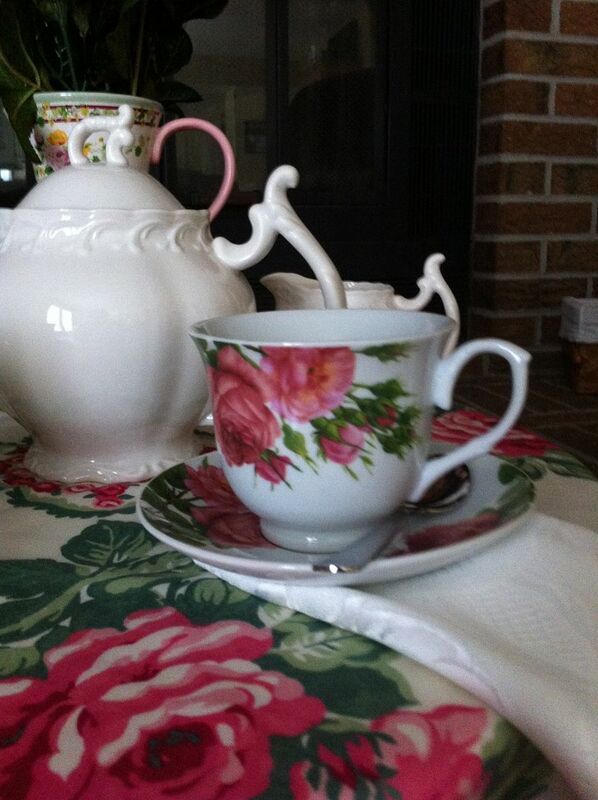 Dear Kathe I so enjoyed your post about tea with your Mom. The tea service and table are so beautiful. When I think of my mom I smell lavender. That was her favorite. Blessings to you sista blogger. Oh Kathe, what a truly sweet post. Oh my gosh! I lost my sweet and tiny Mom 19 years ago and not a day goes by I don't think of her, too - but I had my sisters and 2 daughters..............it had to be tough for you. I know your Mom is smiling at your party and is so proud of you and your love and how you haven't forgotten her. PS I am only 5 foot and a half and I stress the half a lot too, I love that your momma did too! It's a short thing! Such a lovely table. I lost my own Mom when I was in my 20's. My own children never knew her. I love your sweet tribute. What a beautiful and poignant post. I'm so sorry that you lost your mom at such an early age. I am sure she is proud of the beautiful tea you set. I love that she dressed up for Luke and Laura! I don't think soap operas are as much appreciated as they were when I was in high school. You made me smile with all those wonderful talk show hosts too because I remember all of them. What good times those were. Sometimes a recipe never tastes right just because we aren't in the same place where it tasted best. I know there are recipes my mom and I both make the exact same but for some reason hers always tastes better, ya know. What a thoughtful, emotional post! What a sweet way to remember your Mom. The table is so pretty, a nice place for remembering! A lovely tribute to your mother. I lost my mother very young as well. She was on 56 and she passed away in 1962. Kathe, this is absolutely beautiful! What a wonderful tribute to your mom! 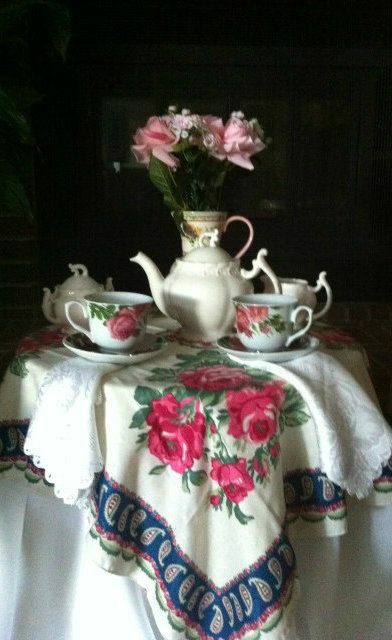 What a sweet tea set and such wonderful memories! Thank you for sharing this tribute to your Mother at Potpourri Friday! Kathe, what a touching post. Sit down with your cup of tea and a photo album and enjoy the memories. Your mother sounds wonderful! What a beautiful way to remember her! Thank you for sharing that piece of you with all of us. It was wonderful to read! Oh sweet Kathe, your loving mother did raise a beautiful daughter like her in you as I know you are one wonderful lady my friend. I loved this beautiful post in honor of your dearest mother, but memories and their teachings is what we have to hold on to now that they've passed on...I feel like you when my dad passed away 16 years ago and I miss him so much and wish I could talk to him and receive his confort. Your gorgeous table and lovely china is got me swooning! Have a nice weekend and a safe one too. 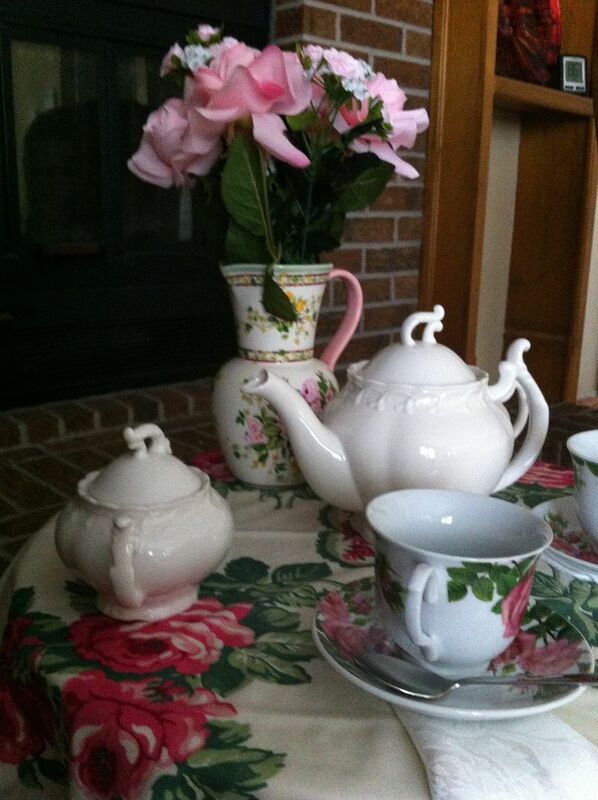 My Kathe, I know your sweet mom did see that tea table. I could hear her tell the angels that she would be unavailable. My mom died young also. I often think about the things with my children she missed. WE will see them again one day. Calling by from Share your Cup, what a beautiful vignette and loving tribute to your Mum. I am so happy you have shared your mother's tea with us! She would be simply delighted, I know, and proud of you too! It was a lovely tribute and I would imagine many of us reading your post would be doing so dabbing their eyes. 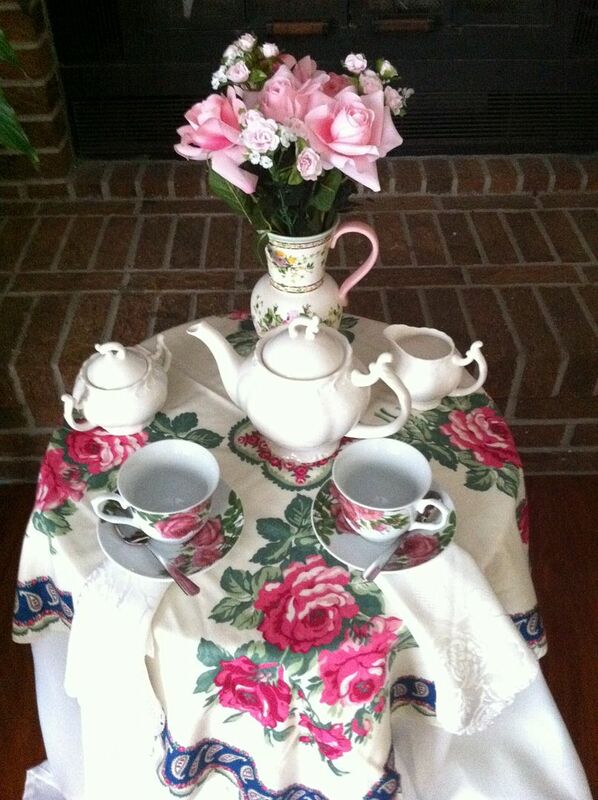 Your tea table is so very pretty and welcoming. I used to be five feet right on the nose but I lost a half inch, so I'm stressing the half too these days. ;) Have a lovely weekend and thank you so much for coming to my party. Kathe, this is one of the most beautiful blog posts I have ever read--I had a hard time getting through it because I couldn't stop crying! What a wonderful tribute to your mother. You have such a wonderful spirit! Kathe, I couldn't stop crying. What a wonderful tribute to your mother. My mother has been gone 4 years and I cry everyday. We were best friends. Thank you so much for sharing your memories of her on Simple & Sweet Fridays. You're a wonderful daughter. What a sweet post and a great tribute to your mom. Your table is amazing and the dishes and everything is just perfect. Happy VTT! Your tribute to your mom was great, and I found it in such a special time for me. Yesterday marked two years that my mom went to Heaven. 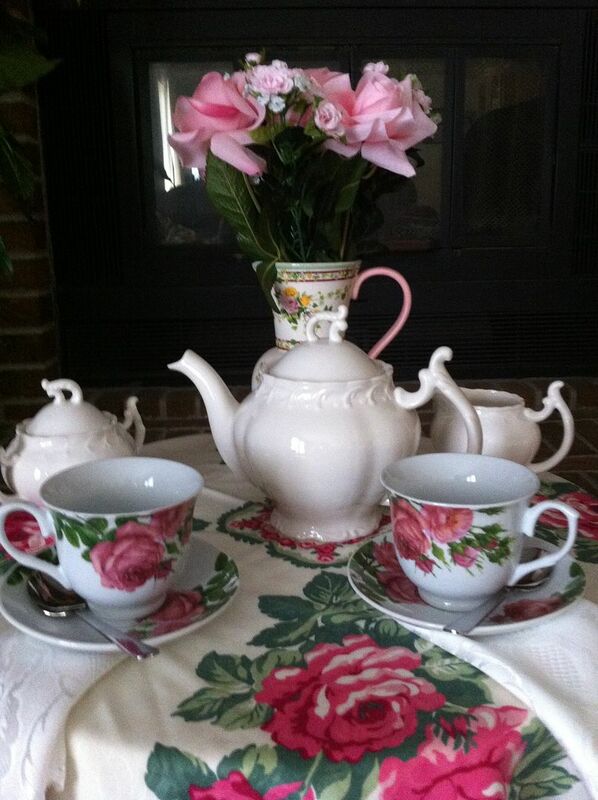 She loved tea and roses, and I started collecting tea cups with roses because of that. Thank you for sharing your beautiful pictures and memories of your mom! Kathe, what a beautiful tribute to your mother. You have inspired me. This year I definitely will make an ofrenda during the Days of the Dead for my mother, also gone far too soon, 30 years ago. A sweet story and a beautiful tea party setting! What a lovely tribute to your mother. Today is my mother's birthday! She is 80! We will be traveling to Cincinnati for a big party! Kathe, this is the sweetest, dearest post. I'm so blessed to still have my mom. She will celebrate 98 years in October. Thank you for sharing this beautiful tea. Oh Kathe, what a sweet and wonderful post. It made me teary. What a wonderful way to honor her on her birthday! Your Mum sounds like a fun person to be around. May you enjoy basking in the memories she created with you. I loved that you shared you Mom with us, my Mom's been gone 17 years, seems only like yesterday. You were as close to your Mom as I was to mine! Your post was touching and brought memories that my Mom and I shared. You never stopped missing them, such a great part of our lives. I always miss the unconditional love from her. Thanks for sharing your creative inspiration with Sunday’s Best – you helped make the party a success! Such an wonderful way to remember your Mother! Very sweet, Kathe, the sentiments and the table. I think she would enjoy your tea very much! What a wonderful tribute to your mother! It certainly sounds like she was a lovely person! Everything about this is beautiful! Wonderful post, wonderful tribute and I'm sure a wonderful lady. Oh Kathe, this is a sweet and lovely tribute to your mother. 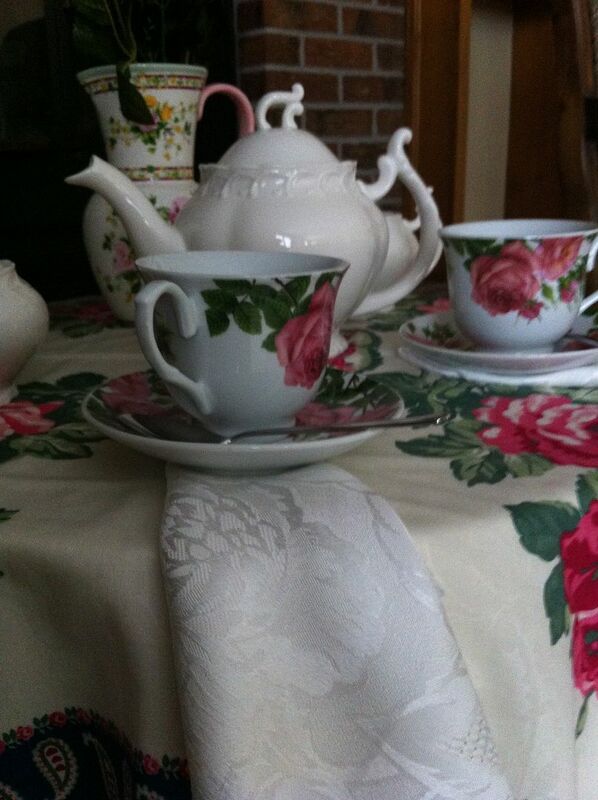 Everything on your tea table is just perfect for a tea with your mom. Thank you for sharing this story with us at TTF. Have a wonderful day! Kathe, this was just beautiful! The words and the tablescape. Your mom reminds me of my grandmother, 4'11" and her love of soap operas. Thankfully she is still with us and going strong, your words have sure made your mother proud. Thanks so much for linking this up to Show & Share Wednesday! What a beautiful post, thanks so much for sharing. I enjoyed hearing about your mother and her life, as well as her passing. It's so hard for people to lose a loved one suddenly, but what a wonderful thing that there was no long suffering, and that she even got to spend the day with your son! What a lovely remembrance of your mother, Kathe. I used to love Merv and Mike, too, and watched them when I was growing up! Your tribute could not have been more touching! My mom is a few years younger, and was always a traditional housewife (stay at home mom -these days). I remember her watching some favorite soap operas every day, too! She sounds like a wonderful lady, how fortunate that she was able to be with her grandson! Such wonderful memories. Such a tribute! Great to have you be a part of Seasonal Sundays. Looking forward to having you with me this Sunday. Oh my goodness, what a beautiful tribute to a beautiful mom. I am a bit misty-eyed after reading your sweet description of her. And the table looks gorgeous, as usual. Thanks for sharing this with my readers. Thanks so much for sharing. What a beautiful setting. I'm so sorry you have had this loss in your life but what a beautiful way to remember your mom and to share her with us. Thank you for your post. Oh, the tears! I am sure she did tell her friends just that! Such a beautiful tablescape and post. Thank you for sharing! This is so beautiful. I'm crying while I'm reading and writing this. I can't even imagine your loss. Your mom sounded like a wonderful person. My dad passed away 5 year ago, and there isn't a day that goes by that I don't think about him and miss him. I know it gets better over time, but sometimes it's still hard.